Hiatal hernias are often encountered in obese patients undergoing weight loss surgery. Current practice trends, while performing a gastric band include vigilant exploration and repair of any diaphragmatic hiatal defects encountered intra operatively. This is not yet widely advocated during gastric bypass procedures, which may leave a number of small hiatal hernias untreated. Presence of perihiatal fat my occlude a small hiatal hernia at the time of initial operation which enlarges post operatively as weight loss ensues. In addition, creation of a gastric pouch untethers it from its original attachments which in turn renders it relatively mobile and predisposes herniation. 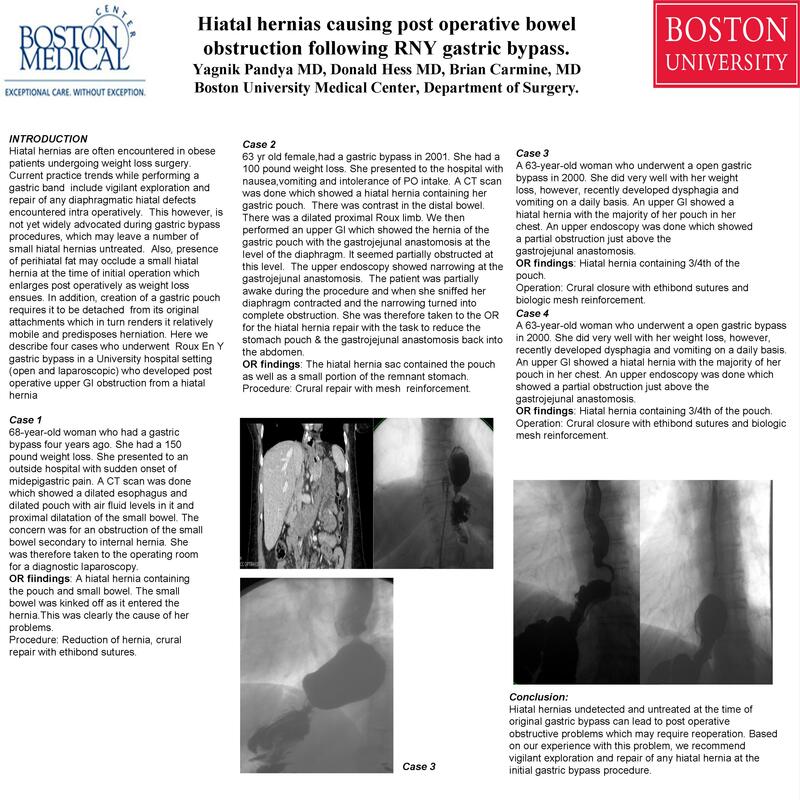 Here we describe four cases of Roux en Y gastric bypass in a University hospital setting (open and laparoscopic) and developed post operative upper GI obstruction from a hiatal hernia. Two patients had a complete obstruction at the gastrojejunal anastomosis while the others had a partial obstruction. Epigastric pain, dysphagia and vomiting were common to all four. Work up included a combination of abdominal CT scan, upper GI imaging under fluoroscopy and EGD. All cases were approached surgically and exploration revealed the presence of a hiatal hernia with the neo stomach (pouch),anastomosis and in one case proximal roux limb in the sac. The hiatal hernia either lead to a complete or a partial obstruction at the gastro-jejunal anastomosis causing symptoms. They were repaired by excising the sac, repairing the crural defect and insertion of a biologic mesh. This led to resolution of symptoms post operatively. Based on our experience with this problem, we recommend vigilant exploration and repair of any hiatal hernia at the initial gastric bypass procedure to avoid patient morbidity.